Last summer, the rough, knowing hands of tribal elders guided young Diné women through planting, harvesting, and grinding blue corn into meal for muffins and chackewe (porridge). The knowledge of how to cultivate and prepare the slate kernels has nearly vanished from Pine Hill, a Ramah Navajo Reservation community 50 miles southwest of Grants. The Oso Vista Ranch Project hopes to expand this year’s pilot field into an entrepreneurial enterprise, complete with a processing plant will that provide vital jobs and a source of healthy Native foods, and preserve this element of culture for local residents. “The funding from the New Mexico Community Foundation has given wings to all of this,” says Margaret Merrill, executive director of the Oso Vista Ranch Project. The Blue Corn Path to Empowerment is just one venture the foundation has grown from tender shoots to hearty stalks during its three decades, which it will celebrate this month at the New Mexico Community Foundation 30th Anniversary and 2013 Luminaria Gala. The story of the organization’s origin, in 1983, illuminates much about its character: It began when Susan Herter, Bruce Rolstad, and Peggy Driscoll set out to pool resources to serve the state’s most vulnerable rural and Native communities. Shortly thereafter, Driscoll, an heiress of the Weyerhaeuser family and one of the foundation’s intended benefactors, died in a car crash, leaving the fledgling organization to make its own way. It did so wholeheartedly. One of its first grants was awarded to Symbols of the Southwest, which the NMCF began and has since spun off to become Cornerstones, the organization behind historic reconstructions of buildings such as San Miguel Mission, in Santa Fe. President and CEO Jenny Parks takes pride in the foundation’s scrappiness. The NMCF manages $25 million in assets—a moderate amount in foundation terms, but, through tenacious networking and grant writing, it leverages the funds of foundations five times its size. From 1995 to 2012, it gave $52 million in community grants, more than $7.5 million in the past two years alone. 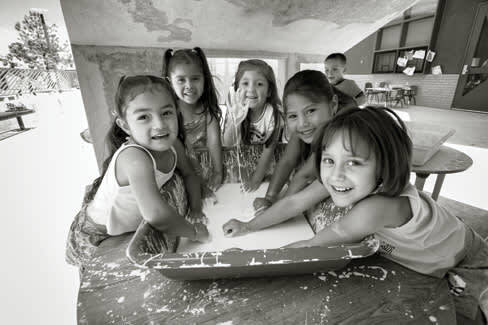 The NMCF also supports initiatives for women and girls, and solidified this priority in 2011 with NewMexicoWomen.org. This initiative gives to programs such as Brave Girls, a subset of the Santa Fe Indian School Leadership Institute, led by founder Dalene Coriz. “I was raised by a single mother, an aunt, and older cousins—a good group of women. I realized that our families were changing and saw a need for that kind of mentorship and guidance,” says Coriz. Brave Girls encourages self-confidence and healthy lifestyles among high school girls, giving them a forum to discuss and overcome the challenges they face as tribal women. As this article went to press, the NMCF was set to give $70,000 in chispa (“spark”) grants before the end of the year. Organizations can’t apply for these grants—they must be nominated by a committee of anonymous members—so the bonus funds are a surprise with no strings attached. “They’re our way of saying ‘Keep up the good work’,” says Parks. Although strategic giving is ideal, the NMCF is also a philanthropic first responder in emergency situations, helping with needs such as housing animals that fled the 2011 Las Conchas Fire in the Española Valley Animal Shelter, and replanting a Santa Clara Pueblo canyon with seedlings after it was devastated by the same wildfire.